Just like many of you our family has been hit hard with some kind of nasty virus that just would not leave. But we are better now. Hurrah. Thus I resumed my pie ventures. And maybe I should have waited one more week because the results were less than inspiring. 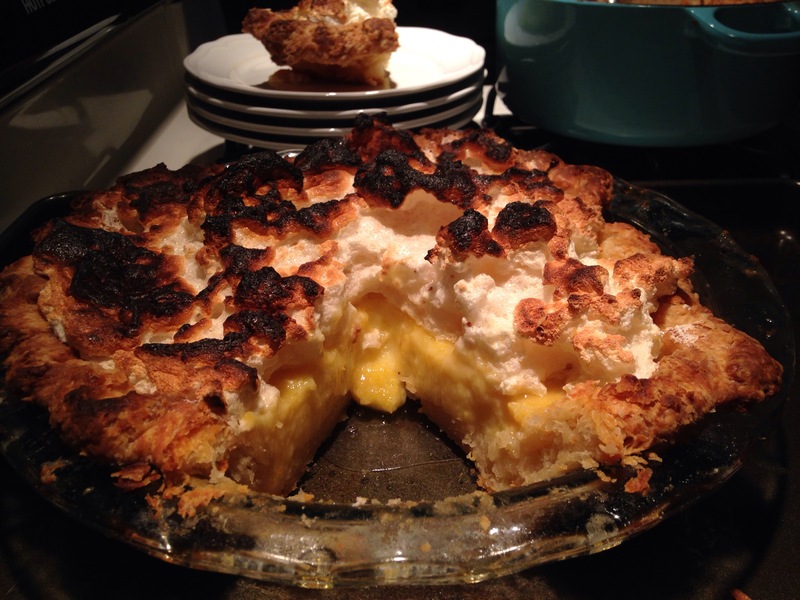 My crust was chewy (in a bad way) and my meringue was burnt because the baby decided to destract me while I was browning it. It’s his fault not mine. But the filling was so tart and sweet and wondrous. So that’s a plus. Let us pretend for a moment that my pie looked like the pie above. And then let us also pretend that my hands aren’t so veiny (that’d be great). But for giggles I’ll post the actual photo of my pie. It’s a process, people. I am doing my best. In a large bowl, whisk together the eggs, sugar, sour cream, zesty, and salt until fully blended. slowly pour in the juices while whisking constantly, until they are fully incorporated. Put he pie crust on a baking sheet. Pour the filling into the crust and bake for 30 to 25 minutes, until the filling has just set and is slightly wobbly in be center. Remove the pie to a wire rack. While the pie is baking, in a dry, sparkling clean bowl, whip the egg whites with the cream of tartar and vanilla until soft peaks form (this is easiest in a stand mixer). Slowly pour in the sugar and continue to whip until glossy, stiff peaks form. Pile or pipe the meringue onto the hot pie surface, and make sure it covers the entire filling, reaching all the way to the crust. 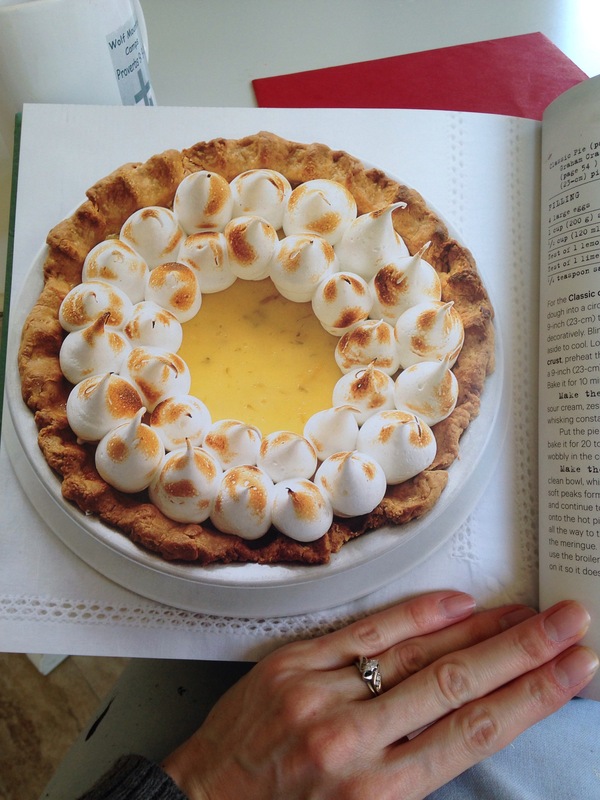 Use a kitchen torch, you can also use the broiler to toast the meringue. Just keep a close eye on it so it doesn’t burn, and don’t let us go for too long. Serve immediately. prepare the butter and lard, if using. Cut the butter into 1/2 inch cubes and cut the lard into smaller pieces. Return them to the fridge or freezer to cool. In a liquid measuring cup, stir together the milk and vinegar. Refrigerate the mixture until ready to use. On a clean flat surface or in a large shallow bowl toss the flower, cornstarch sugar and salt together lightly to blend. Add the butter and lard if using to the dry ingredients and, using the tool of your choice cut the fat into the flower with speed and patients, until the fat has been reduced to Smallpiece ice chunks. Try to use a straight up-and-down motion avoiding twisting your breasts as you move the more you press on the flower the more test gluten will develop in the dough. Avoid using your fingers, as the heat from your hands without the fat and further encourage gluten development. Unlike pasta or bread gluten is the enemy of pie dough so be gentle and be quick. What’s your fat has been cut down to size spread your mixture out gently to expose as much surface area as possible. Gently drizzle half of your milk mixture over the flower trying to cover as wide area as you can. You spent scrapers are large spoon, toss the flower over the liquid don’t stir just lightly tossed spread everything out again and repeat the process with the second half of the liquid. You should have a doe that will just hold together when pressed against the ball with visible little chunks of butter if you need to add more liquid to find it do so it’s more cold milk adding a tablespoon at a time until you reach the right texture it’s not an exact science, as everything from humidity today in the air to the dryness of the flower will affect the consistency of your toe. Was he reached your goal cover the dough tightly in plastic wrap and refrigerate for at least one hour the dough can be capped in the fridge for up to one week, well wrapped, or in the freezer for up to two months.